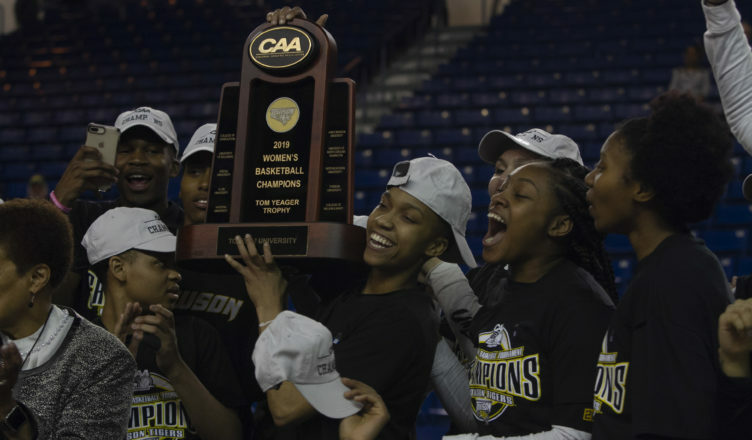 An improbable season turned into an impossible run to the championship as the Tigers captured their first Colonial Athletic Association (CAA) Tournament Championship over the weekend. With the title, Towson will play in the NCAA Tournament for the first time in school history. The CAA Championship game against the No. 2 seed Drexel Dragons was a rubber-match of sorts as the Tigers split their regular season games with the Dragons. The first half saw Towson playing from behind most of the time as the Tigers did not take a lead until the final basket of the first half when junior guard Ryan Holder made a layup to put Towson ahead 28-27 at halftime. In the second half, neither team could gain a two-possession advantage as they battled back-and-forth. Once again, it was Towson taking a late lead, this time on a three-pointer by senior guard Danielle Durjan as the Tigers entered the fourth quarter with a 39-38 lead. After Drexel took a three-point lead early in the final quarter, the two teams exchanged baskets for over five minutes. “We knew that there was a lot of time still left in the game and being down three is nothing to us,” said junior forward Nukiya Mayo. After forcing consecutive turnovers, the Tigers had the ball with 48 seconds remaining, and a one-point lead. Redshirt sophomore guard Kionna Jeter made the play of the season, sinking a two-point jumper to put Towson ahead by three with 25 seconds to play. After the Tigers forced another turnover, it was Mayo’s clutch free throw shooting that sealed the historic 53-49 victory for Towson, a victory that many did not expect would happen at the beginning of the year. The Tigers will wait to find out who they will face in their first NCAA Tournament game when the bracket is revealed on Monday night. Richardson looks forward to however her team learns their fate. In their first CAA semifinal appearance since 2008, the Tigers squared off against the darlings of the tournament, the No. 9 seed Hofstra Pride. Hofstra pulled off the upset of the tournament with a 57-50 victory over the top seed, James Madison, in the quarterfinals. Early on, it was a close game as Towson entered the second quarter holding a 14-10 lead. In that second quarter, the momentum shifted in favor of the Tigers. Towson set a CAA tournament record with 29 points in the quarter while holding the Pride to just seven points. Mayo was a force to be reckoned with on the court. She drained three straight three-pointers to spark a 22-0 run, giving the Tigers a 43-17 lead at halftime. Mayo scored 13 of her game-high 22 points in that second quarter. The second half was about maintaining their large lead and the Tigers did just that. Although the lead never got below 23 points, Richardson kept her core in the game as Mayo, Jeter and redshirt junior guard Qierra Murray each played 34 minutes. In what was expected to be the closest game of the quarterfinal round, No. 4 seed Towson defeated the No. 5 seed Delaware Blue Hens 59-49. Although the Tigers never trailed in the game, the Blue Hens kept it close for the game’s first 39 minutes. The final minute proved to be the difference maker as the Towson outscored Delaware 8-0 in the final 60 seconds. Jeter led the way, scoring 30 points, including the team’s first 10 points of the second half, and grabbing 10 rebounds for her second double-double in two weeks. The Tigers led by as much as 12 before the Blue Hens slowly chipped away at the lead, getting to within two points with just over a minute to play in the game. Towson would not give in as Jeter and Mayo sealed the victory with four free throws each to advance to the CAA semifinals for the first time since 2008. Before the game, Richardson was recognized as the CAA’s Coach of the Year. Richardson was mobbed by her players upon receiving the award.